"The more you celebrate your life, the more there is in life to celebrate." - Oprah Winfrey. "Чем больше Вы празднуете свою жизнь, тем больше в ней праздников." 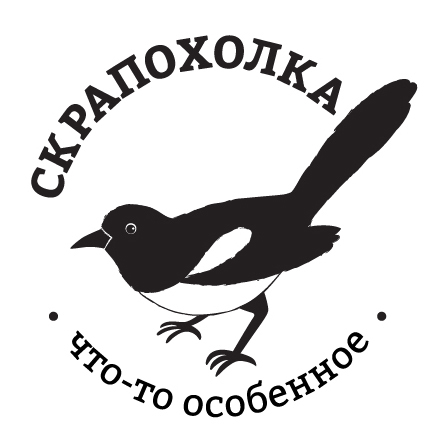 - Опра Уинфри. 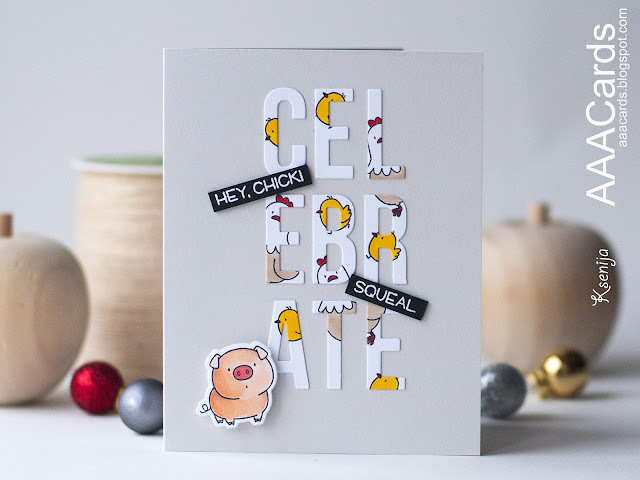 Squeal and celebrate! 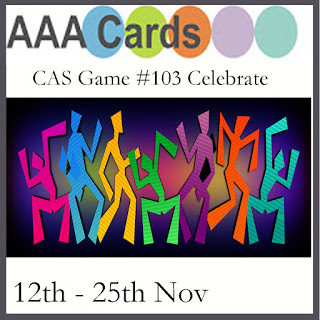 Because the theme of a new game at AAA Cards #103 is Celebration. Писк-визг и праздник! Потому что тема новой игры #103 в чб AAA Cards - Праздник. 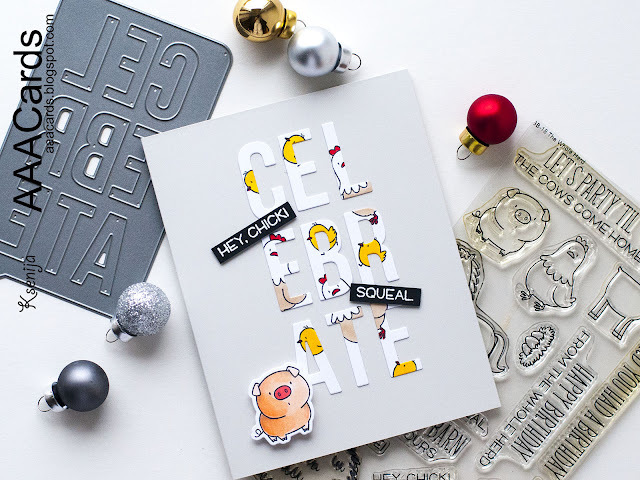 For my card I used Celebrate Speech Bubble die and The Whole Herd stamps and dies set by My Favorite Things. I created my own pattern by stamping and colouring a few images from the stamp set and then die cutting the word out of it. To keep it Clean and Simple I used only die cut letters, which I glued to a soft grey card base. 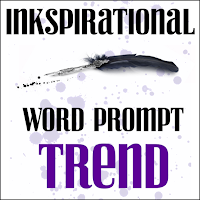 Для своей открытки я использовала нож Celebrate Speech Bubble и комплект штампов и ножей The Whole Herd от американской компании My Favorite Things. Я сделала собственный фон с рисунком, напечатав несколько изображений и раскрасив их маркерами Copic Sketch, а затем сделала вырубку ножом Celebrate Speech Bubble. Чтобы выдержать работу в стиле Чисто и просто, использовала только буквы от вырубки, которые приклеила на светло-серую основу открытки. The words are heat embossed in fine white powder. The piglet is popped up on a double layer of foam tape for extra dimension. Короткие призывы выполнены в технике горячего тиснения на черном кардстоке. Поросёнок также раскрашен маркерами Copic Sketch и для большего объёма посажен на двойной слой вспененного скотча. Hover over photos and click on the Pin button to save to Pinterest or use floating Share buttons on the left side of the screen for desktops or top of the screen for mobile devices. 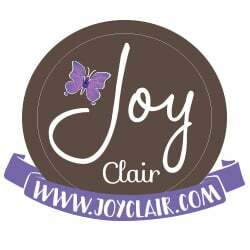 Click here to follow me on Pinterest. Наведите курсор на фото и нажмите кнопку Pin, чтобы сохранить в Pinterest, или используйте плавающие кнопки на левой стороне экрана для компьютеров и вверху экрана для мобильных устройств. Здесь вы можете подписаться на мои обновления в Pinterest. 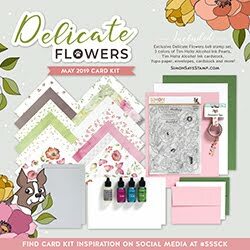 Looking for more ideas for handmade cards with Big Alphas and Word Dies? This card is a spin-off my recent blog post about 10 creative ways to use the Big Alphabet and Word dies. Would you like to see the full list, please follow THIS LINK or click the picture above. По сути эта открытка спин-офф моей предыдущей публикации про Тренды 2017. Хотите увидеть мой список из 10 способов использования алфавитных ножей, переходите по ЭТОМУ ЛИНКУ или нажмите на фото сверху. It's Okey to PIN ME! Наведите курсор на фото и нажмите кнопку Pin, чтобы сохранить в Pinterest, или используйте плавающие кнопки на левой стороне экрана для компьютеров и вверху экрана для мобильных устройств. ЗДЕСЬ вы можете подписаться на мой профиль в Pinterest. 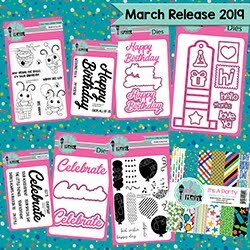 Please be sure to hop over to AAA Cards to see beautiful creations of other Design Team members, find out about the prize and share your creation with us. Thanks for stopping by. Have a great day! Спасибо, что заскочили. Не забудьте заглянуть в блог AAA Cards, чтобы вдохновиться работами моих коллег по ДК. Желаю всем прекрасного дня! How fun are your letters with the background stamping , fabulous idea! Love the addition of the black strip words and the cute little pig. Oh my goodness! Love your take on the challenge theme so much - such a great design! Another cool take on this trend! Such cute animals too. 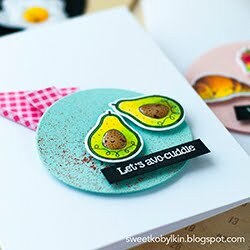 What a cool idea to die cut a stamped image! Very unique and fun design! Thanks for sharing with us at Inkspirational! I can't even!!! I love how your added images to the die cut letter. I may have to CASE this in the future if that's okay! LOVE!!! Such a happy card! I love, love, love the little critters on the letters :) Great quote in the beginning too. I love this design! 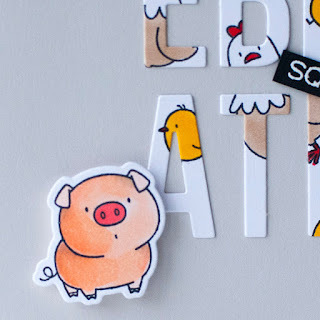 Such a clever idea to cut the letters in this way and I love your cute little piggy. We missed you at the retreat this weekend! 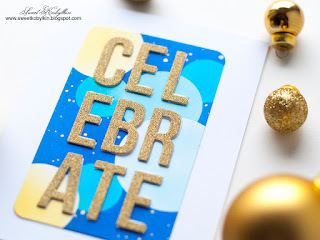 Another gorgeous card with the alphabet dies ! So cute and so CAS ! Love it ! A great way to use these alphabets and "abandoned " stamps for the pattern too ! Thanks for inspiring ! 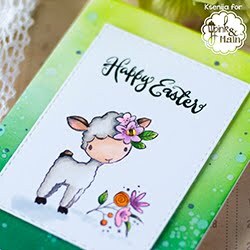 Adorable card, Ksenija. I have yet to stamp on alphabet dies. 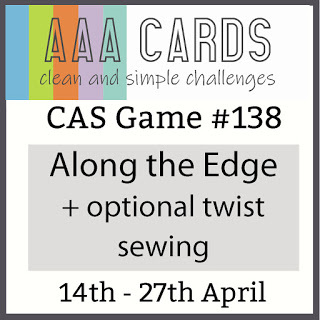 Great technique for making cards CAS. What a clever thing - to color and then cut with the alphabet dies! I just got some alphabet dies and may have to try this! And that little pig is just too cute! Thank you for sharing your talent with us this week at the Tic Tac Toe Challenge! Super fun card -- great use of the stamped alpha letters. Thanks for joining in at STB.